Fair warning this is going to be a longer entry than the ones previous. So, for those in a hurry, here’s a nutshell version: driving out to Eastern Region was one of the most diverse and memorable segments of the trip. Being a Virginian by birth, y’all really did me proud. My dad and I are currently in Oregon and will remain here until we fly out on April 8th. 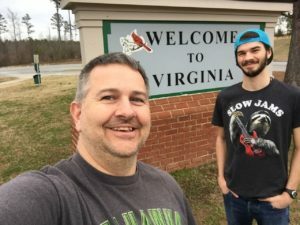 We put just under 10,000 miles on the car over a 8 week period setting off from Wichita, Kansas and passing through (deep breath) Oklahoma, Texas, Louisiana, Mississippi, Alabama, Georgia, South Carolina, North Carolina and Virginia. That’s not even mentioning the return trip! There were a handful of reasons for taking this route. Firstly, dropping south allowed us to avoid the majority of the cold snap that hit the upper states, making road conditions much safer to traverse. However, on a more personal level, I’ve never been to the South before, so getting an opportunity to experience that was a huge bonus. Breaking up the 28 hours of drive time was a must for our sanity’s sake. 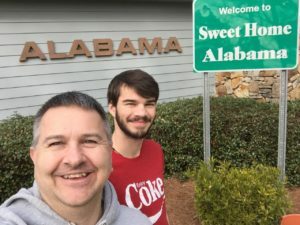 As a result, our trip through the south became a trip back in time. Standing on the grounds where President Kennedy was assassinated in Dallas. Crossing the bridge in Selma, Alabama that was pivotal in the Civil rights movement. Placing a hand on the runway at Tuskegee where the Airmen were trained. All of a sudden history wasn’t some stale distant memory, it was tangible, especially at the latter location. To think these men and women risked it all for a country that didn’t respect them, even after they fought, is mind-boggling. Imagine a combination of admiration, disgust and what I can only describe as second-hand pride as you truly feel a part of the events you read on those walls. That journey is not one that will fade over time in my mind. “An awful lot of talent would have literally gone to waste if it weren’t for some courageous people who said ‘look, these guys should be given an opportunity’ ” -Dr. Twiley Barker. Rather succinctly put if you ask me. To look at a group of people who were on the fringes of that society and see value and potential. Speaks for itself and perhaps a lesson we could all use the reminder on. In contrast to the weighty segments I’ve touched on there were obviously laughs galore. Almost like trapping a father/son duo in the car for 28 hours drive time will produce some shenanigans once we’re let loose. Collecting photos of the “Welcome to …” state signs. Usually at cute little welcome centers along the state lines. We also made a habit of asking locals where they loved to eat other than chains. Rolling up to the Bayou Grill in Louisiana and trying everything from fried corn on the cob to stuffed crab and catfish, put a smile on both our faces. Icing on the cake for this particular meal was a man we endearingly referred to as Cajun Chef, as I understood roughly the same percent of his words as I did The Swedish Chef from the Muppets. Over the course of a minute-long conversation between the chef and the waitress, approximately two sentences were coherent through the thickest of accents. One of which being “Yallhavagoodun” tossing a wave our way as we slip out the door. Now for the obligatory “No idea how time has passed this quick” comment I sign off with… two weeks. Two weeks till this journey comes to a close and we return to Ireland. Let’s make the most of it!